You never know how many words you know until a game or puzzle calls upon you to pull them up. And you also never realize how many words you forget until the same thing happens. A good word puzzle is neither too obvious nor too obscure. It makes you think of concepts in different ways. And it lets solvers surprise themselves with their mental gymnastics. Bonza Word Puzzle does all of these things, and it’s worth a look. 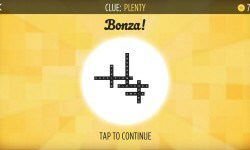 Here’s what happens: Bonza presents you with a clue and a bunch of tiles of different shapes and sizes. Your job is to arrange the tiles crossword-style to form words related to the clue. Sometimes, it mixes things up and throws you a “mystery clue” which gives you only the first letter and length of the puzzle’s unifying concept. It’s sometimes surprisingly difficult, especially when you find yourself staring at a bunch of seemingly random tiles unable to find any words in them. But luckily, Bonza doesn’t have a timer to make you feel rushed, so you can always take your time. And that’s good because I’m pretty dumb sometimes. Completing levels earns you coins that you can use to unlock hints (the game will show you one of the words) or reveal mystery clues. You can also ask your friends for help by posting a shot of the puzzle to Facebook, Twitter, or in an e-mail. Bonza comes with three packs of 30 puzzles, and you can buy more for a dollar apiece. It also provides free daily puzzles, so even if you don’t pay anything beyond the entry price, it’ll keep providing you content. Clever, occasionally frustrating content. That’s cheap sometimes and makes me feel dumb. But maybe you’re smarter than I am, and you’ll be alright. The Good: Deceptively challenging and engaging, and the music will put you into a zen-like, puzzle-solving mood. The Bad: Clues can be a little obtuse sometimes. The Verdict: It’s a word game for word lovers, and it has enough content to make the price a fantastic deal.